I figured it was time to post another scary looking plate of pasta, so I made some foratini al pomodoro for breakfast. 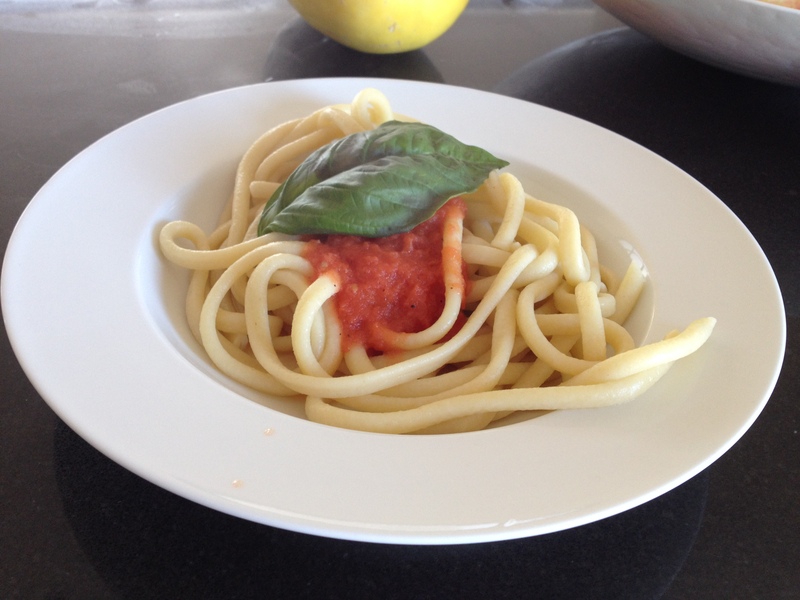 I bought the fresh pasta from Assenti’s, and made my the sauce from 6 roma tomatoes, olive oil, garlic, and fresh basil. Foratini is a huge noodle, and is a little chewy. I bought it to scare the low-carb’ers. I’ll buy spaghetti next time. I learned to make the sauce in Italy. You blanch the tomatoes in near-boiling water for a minute or two, until you see the skin break. Then cut the tomatoes in half, and remove the skin and seeds. Keep only the fleshy part of the tomatoes, and purée them. Heat some olive oil in a saucepan, and fry a quartered clove of garlic until golden. Remove the garlic from the oil. Add in the puréed tomatoes and basil, salt & pepper, and reduce without a lid at medium heat for about 15 minutes, stirring frequently. It’s a snap. ← Previous Post Should I Try To Lose Weight Faster?